If you're stuck in a styling rut or bored of sporting the same hair looks day-in-day-out then it's time to break free of the chains and liberate your look with Potion 9. Similar to a humble white tee, this conditioning concoction provides your locks with the ultimate styling staple. From boho waves to silky smooth locks, Potion 9 rocks every look in true catwalk style. Potion 9 is a unique style-care hybrid that works to simultaneously restore the health of your hair while providing style definition and control. Infused with nine botanical extracts including Jojoba seed oil, Safflower seed and Babassu oil, this advanced treatment has a cumulative effect - the more you use it, the stronger your hair becomes. For finer hair types that don't want to compromise on style, a lightweight version, Potion 9 Lite, provides weightless conditioned hold. 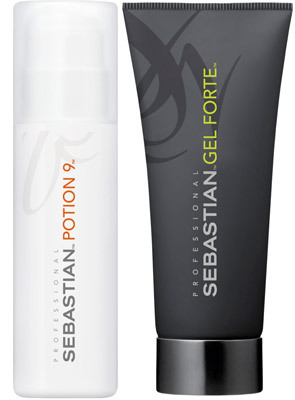 GF + P9 = Hold If you want to achieve uncompromised hold, layer Gel Forte with Potion 9 to create conditioned movement and shape. Unlike your high school algebra, these styling equations are anything but dull. So wave goodbye to drab hair days and experience limitless styling possibilities with Potion 9, where the only limit is your imagination. To inspire endless possibilities, Sebastian Professional has enlisted trendsetter, Harley Viera-Newton onboard to showcase Potion 9's endless styling options. As a part-time DJ, model, Egyptology graduate and style icon, this multi talented Sebastian Visionary epitomises the brands vision of continuously pushing the boundaries to unveil unexpected sources of inspiration.